If you can afford it, this is a winning creamy, long-lasting eye shadow. Available in at least 15 light to dark shades, the tiny screw-top pot of sometimes shimmer-y, sometimes satin-y shadow can last for months. Apply to the naked eye with fingers to get sheer results. Apply with a brush for stronger color. Lighter colors are great as highlighters beneath or beside powder shadow and eyeliner. Color won't crease or budge until you're ready to remove it. At first i didn't like the color on me but that was when i had burgundy hair. Now that im my natural strawberry blonde i really like it & would repurchase if it wasn't so expensive. I have to wear a primer with this or it doesn't seem to last all day on my lids, such a shame. But im still going to give it high marks because its easy to put on, nice color & a little goes a long way. I've had it abo...read moreut a week or so and am on the fence. The positive is it definitely last a long time (absolutely all day). It goes on fairly easy, and light. Maybe it's just the color, or the fact that it dries so fast, it's hard to blend with other colors. You can put other powders on top. I noticed when I do, the powders wear away by the end of the day, but this base cream coat hangs in there for the long haul. Maybe it feels a little too unnatural for me, I don't know. I may try a different color and see if that changes things. With the right color, it would definitely be a good fit for humid days, or exposure to the elements, etc. I bought this at the same time as buying Burnished from Sephora. (Very thrilling that Sephora carries BB now!) Anyway, this is a neutral, pale base color with a large amount of gold shimmer and sparkle to it. I will not repurchase as I think it makes my eyelids look wrinkled. However, it is a fine base. Sandy Gold is a better base than Burnished as it does not alter the tone of my powder e/s as much as Burnished. i use this as my e/s color base. its very sheer, will not gives me scary e/s if i'm wearing smokey eyes. i use this after MAC prep+prime, then apply the e/s. i found after 2 hrs it will crease so badly on my eyelid. compare to MAC pp, these more expensive and you get lesser product, but compare to quality (what i mean here is the staying power)? i will choose MAC PP. so creamy.. it seems not to last the whole day. I have to supplement it with primer and powder over top to set it. Not worth it, when it is quite expensive! Has a nice finish though. The eye shadow is very long wearing, non-irritating, non-creasing, and non-flaking. 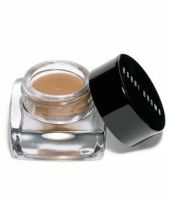 It is easy to apply and goes on smoothly, but dries fast so you have to blend quickly. It lasts beautifully and comfortably all day even with teary, allergy eyes. It does make my lids a little dry though. I tried Sandy Gold and loved the color. It is a pale golden tan sprinkled with very, very fine shimmery pa...read morerticles that brightened my eyes but not enough to bring out wrinkles. The color was great and very versatile. It is expensive, but worth investing in one or two colors to use as a base for your other powder shadows.